Working under the pseudonym Pip & Pop, Tanya Schultz spends her days crafting miniature worlds out of pastel coloured sugar and teensy figurines. Think Harajuku meets Disney On Ice, only pint-sized. It’s no wonder that the Australian artist was asked by Romance Was Born’s Luke Sales and Anna Plunkett to create the set for their Spring Summer 2013 show during Australian Fashion Week. A glowing, psychedelic wonderland of lollies and glitter ensued; a fitting backdrop for the psychedelic ‘Mushroom Magic’ collection that also featured digital mash-ups of Schultz’s creations. Following the show, Schultz chatted to Dazed about her work and collaborating with Oz fashion’s madcap king and queen. Dazed Digital: When you think up your magical lands, are you channelling your childhood? Tanya Schultz: I hope that something from childhood stays with everyone. It’s the part of us that responds to seeing something beautiful or magical, like snow for the first time or a starry night sky in the desert. I want to transport the audience to another place or time. Tanya Schultz: I really love stories about paradise and imaginary worlds, but especially stories of lands made of food. It’s an ancient kind of fantasy that exists throughout many cultures. There’s the French mythological Land of Cockaigne, a place where sugar rains from the sky and the streets are paved with pastries; or Big Rock Candy mountain, a hobo's idea of paradise; or Willy Wonka’s chocolate factory. DD: What was it like working with Luke and Anna? Tanya Schultz: The whole project was a joy! They are just brimming with ideas and inspirations. DD: What materials did you use for the show? 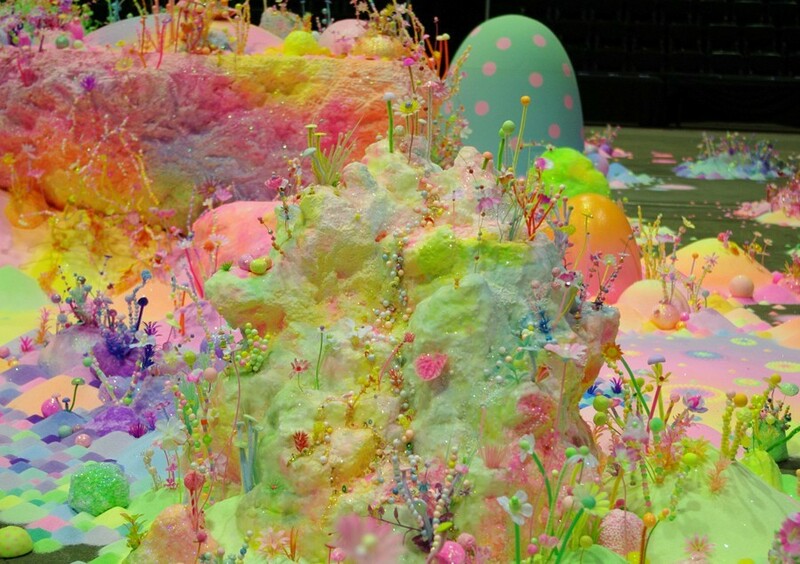 Tanya Schultz: We used about 500 kilograms of coloured sugar! I used thousands of materials; glitter, modelling clay, pompoms, pipe-cleaners, beads, wire, plastic flowers, aquarium plants, anything that is colourful, sweet or magical in some way. I also collect strange little things when I travel, like miniature mushrooms from Amsterdam, fake birds from Hong Kong, and tiny cakes from Japan. Japan is my favourite place to source materials. Luke contributed a little mushroom man and Anna a pair of white swans. Tanya Schultz: Yes! They made everything twice as good as it was to start with, like the photos of little sugar flowers I made that were layered into crazy flowery patterns. Tanya Schultz: I’m back to Japan tomorrow and then the rest of the year is pretty crazy with projects in Melbourne, Adelaide, Hong Kong and then possibly Japan again.